I rarely make graham crackers, but I needed some in a pinch and didn’t feel like going to the store. We had all the ingredients, the most important being the wheat flour. And since we had coconut oil and almond milk, I decided to swap them for the usual shortening and milk and make vegan graham crackers. The results were fantastic! These really exceeded our expectations, and I’ve made the crackers at least 3 times since. As you can see from the first photo, I monkeyed around with the thickness a bit and sprinkled cinnamon sugar on a few of them. All of the versions were good, and while the thicker ones were prettier, the overly browned thin ones were hard to stop eating. 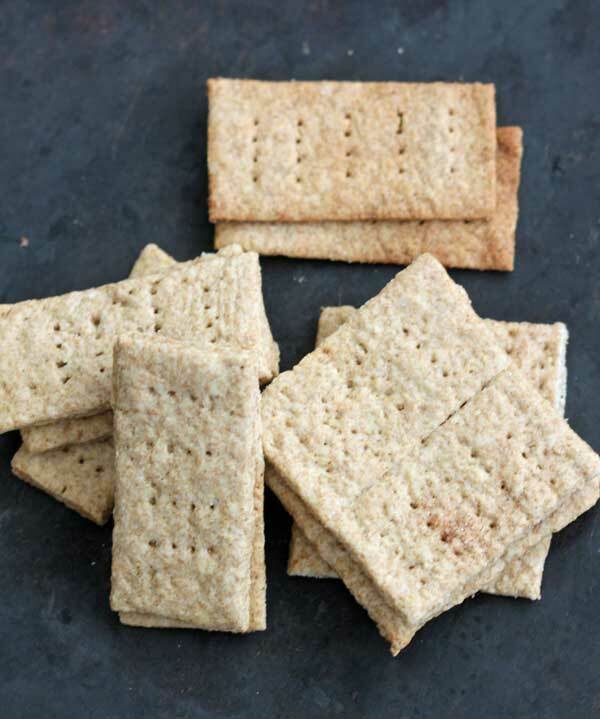 They had texture of Wheat Thins, but the flavor of graham crackers. For this recipe, I started with a basic one that calls for shortening and milk, but used the aforementioned coconut oil and almond milk to cut the dairy. In addition to that, I increased the salt and vanilla for more flavor, then changed the baking temperature and time. I have found that baking graham crackers at 300 degrees rather than the usual 350 or even 325, helps them bake evenly through and through. Cutting the dough into squares, a process I thought would be tedious, was actually really fun. The dough was easy to work with and rolling it out between sheets of parchment paper was a breeze. Also, cutting and trimming the dough with a pizza cutter was kind of fun and reminded me of playing with play dough. It was also nice not having to worry about separating the dough into perfect squares. Scoring the dough and separating the baked crackers worked just fine. And finally, I kept the batch size pretty small. You can always double it if you want, but I recommend making the recipe using these amounts first, and if you like it make it again. Update: I love this recipe and use it all the time. If I have trans-fat free shortening, I sometimes use that instead of coconut oil. I’ve also come up with a chocolate variation and have added it to the notes. 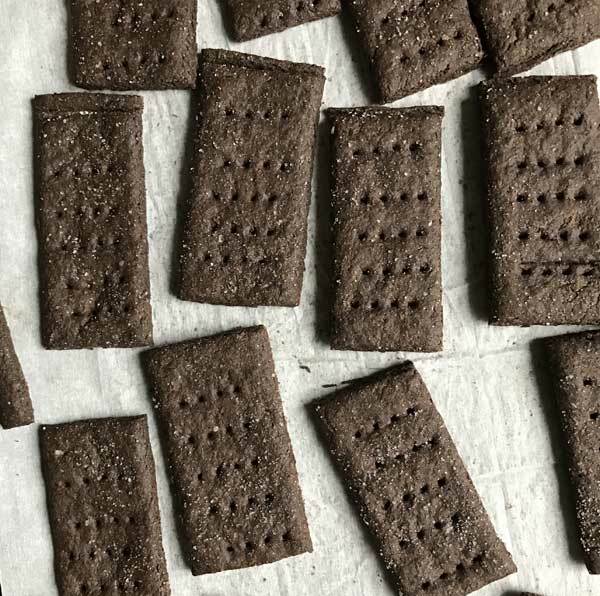 Whole wheat vegan graham crackers made with coconut oil and almond milk. For the almond milk, I used Trader Joe's unsweetened vanilla flavor. Preheat oven to 300 degrees F. Have ready two large baking sheets. Mix the flour, baking powder, baking soda and salt; set aside. In a mixing bowl, using an electric mixer, beat the coconut oil, brown sugar and vanilla until creamy. Add the flour mixture to the vanilla and stir until crumbly. Add the almond milk one tablespoon at a time, stirring until dough holds together. It will be on the dry side, but it should hold together and not fall apart when you press it down. I usually knead it just a bit to get it to come together (but don't overwork!). 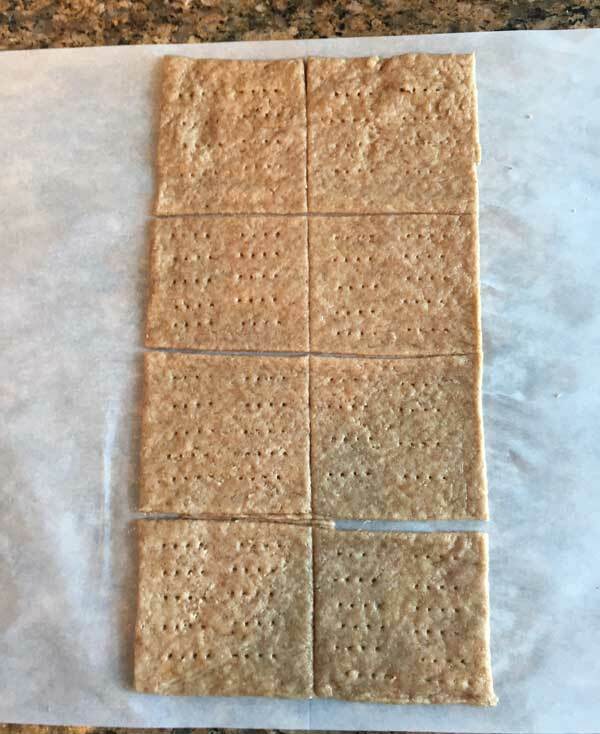 Working one half at a time, press the dough down flat on a sheet of parchment paper, then using another sheet of parchment paper on top (or a sheet of plastic wrap if you prefer) roll to make a 6x12 inch rectangle about 1/8 inch thickness. Obviously you can't roll it right into a perfect rectangle, so start by rolling an elongated 1/8 inch slap and just tripping and re-piecing dough to make a neat rectangle. With a pizza cutter, score rectangle cross wise to make 4 (3x6 inch) rectangles, then lengthwise to make 8 (3x6 inch) squares. If desired, make 4 more cross-wise slashes so that you have 16 small rectangles. Using a fork, make 4 or 5 pokes down each rectangle. Do not separate the pieces. Put the parchment and scored dough on a baking sheet. Repeat with second half of dough. You can put both the second triangle on the first baking pan or put it on a separate one and bake two sheets at a time. Bake at 300 degrees F for about 20 minutes. Turn off the oven and allow the crackers to sit in the closed “off” oven for another 10 minutes. I recommend baking one slab of dough using the recommended baking times and evaluating just how much time you'll need with your oven. In my oven, I get perfectly crisp and crunchy crackers by baking for 20 minutes at 300, then leaving them in the "off" oven with the door shut for another 10 minutes, then removing and cooling. If I roll the dough super thin, the crackers will crisp up after just 20 minutes at 300. You may need to play around with the bake times depending on your own oven. Chocolate Variation: Take out 2 tablespoons of the all-purpose flour and use 3 scant tablespoons of Dutch process cocoa (Hershey's Dark works well). For the coconut oil, feel free to substitute 50 grams of trans-fat free shortening. If you like the Vegan Graham Crackers, let me know! Next time I may try using coconut milk instead of the almond milk just to see if it makes a difference. I also think it might be fun to try incorporating some actual coconut. I made this recipe with coconut sugar because I have an allergy to cane sugar. They came out great! I found they were even better the next day as then they were completely cooled and delightfully crunchy. I’ll be baking them again. I don’t think I’ve ever made graham crackers. These sound good! I like your suggestions to score the dough and finish cutting later, and to bake at a lower temp for even browning. I will make a note to try those tips next time I make them (I like the recipe from King Arthur Flour Whole Grain Baking, which is the only one I’ve tried). They also have a chocolate version. Happy baking!